Exotoxins are usually heat labile proteins secreted by certain species of bacteria which diffuse into the surrounding medium. 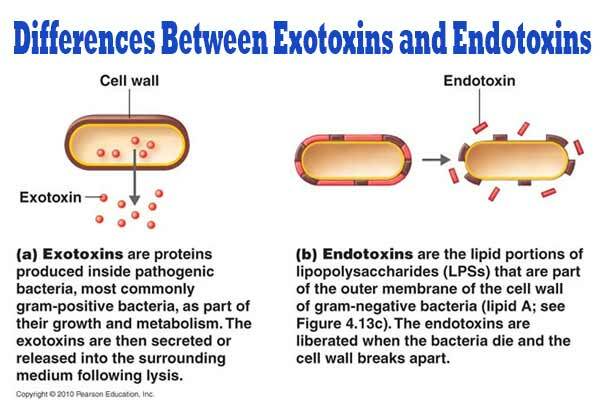 Endotoxins are heat stable lipopolysaccharide-protein complexes which form structural components of cell wall of Gram Negative Bacteria and liberated only on cell lysis or death of bacteria. It is polypeptide It is lipopolysaccharide complex. On boiling it get denatured. On boiling it cannot be denatured. Does staphylococcus aureus have endotoxins? endotoxin release when bacteria is lysed or dead. after lysis of bacteria the cell wall of gram negative (lps) bacteria work as a endotoxin. endotoxin increase the temperature of human body so it is fever producing toxin. so endotoxin testing is necessary in all IM & IV fluid. Why is exotoxin highly antigenic and endotoxins weakly immunogenic since the molecular weight of endotoxins(50-1000kDa) is greater than that of exotoxins(10kDa)? what is the difference between pyrogen testing and endotoxin testing? My question is why endotoxines not converted to toxoids? 1-Are there any bacterial toxins that are not secreted out and are kept within the cell? 2-Are there any lipid toxins? 1st :endotoxins are not secreted out of the cell , they only act when lysis of bacteria occurs. there is a small mistake regarding the enzymatic activity of toxins. the exotoxins have enzymatic activity which can e denatured on heating while endotoxins being LPS has no enzymatic activity and has no effect of heating because of lipid nature. Your comment is correct. The lipopolysaccharide component of Gram negative bacterial cell wall has no enzymatic activity, and is chemically not related to the protein enzyme composition. Bacterial pyrogens are not affected by most sterilization processes, such as steam, ethylene gas, and gamma or electron beam irradiation.